Authentic Audiences Purpose: Engaging Students in Learning that Means Something by John McCarthy, Ed.S. When my kids get excited about school it’s a wonderful moment. This is especially true as they are teenagers attending a Project Based Learning School. Those moments occur “only” (yes I’m being absolute) when the topics and outcome is connected to the world beyond school. During my son’s freshmen year at Ardis New Tech High School, a Geometry-Art project focused on students creating soup bowls to be auctioned off at an event known at Empty Bowls. Local potters also craft bowls that are donated, like the students’ work, to the auction. The proceeds support the food pantries in the local area. The students learned art and Geometry concepts throughout the PBL unit. At the evening event, parents and community were invited to see the artwork and participate in a silent auction for the bowls of the local artists. Parents got first dibs on buying their child’s bowl J. The power of that experience remains today because students had a voice in their community. They understood the connections of curriculum and context with the world outside academia. As a parent, I see the growth this experience had for my child and value every opportunity that the school provides in this area. As a PBL consultant, I would like to see such experiences happen more often than the pretend scenarios that tune out students, including my own. Scenarios can be intriguing at first, but lose momentum when students realize that the work will go no where and to no one once it’s done. The results, like most traditional assignments, are submitted to the teacher for a grade—and goes no further. Having an authentic audience and purpose has so much upside. Students engage into the work, sustained by the energy that the results are purposeful and awaited by an audience beyond the school. It snaps them out of the Checklist Mentality that I discuss in an Edutopia article. They connect the curriculum with real purpose, and not—as students perceive—just academic hoop jumping. The key to turning scenarios into real world experiences that students find meaningful is to identify a focus that connects curriculum to a community. Now the term “community” is used metaphorically. Community can be local, national, or global. It can also be the school building or district, although this framing is one I suggest be used less often then the others. We want students to grow into becoming contributing members of the wider communities. Our curriculum informs on what learning outcomes needs to be addressed for different units or projects, or bodies of work. Identify what students need to know to a deep level by the end–Keeping the end in mind is a common way of putting it. Once these concepts are identified, ask: If students understand these concepts how can they apply them to a purpose for an audience? If students understand these concepts how can they apply them to a purpose for an audience? The answer to this question is one of the options that follows. Each is a way to frame the purpose of the work, and leads to powerful learning experiences that culminate in students having voice in their “community.” Let’s explore each. There are many needs to be solved in the world. The opportunities exist for students to propose solutions to various audiences who may be aware or unaware of the issue. For example, in Texarkana, AR, North Heights Junior High of TASD 7 did a school-wide project where they worked with 6 local businesses on marketing plans to improve their presence in the community. The results would be especially useful for driving consumers into the community from other areas. The four core areas, English, Math, Social Studies, and Science were incorporated at varying levels so that students could make connections to the content with the important task: Help businesses improve their presence. Other experiences could be as simple as helping the school draw in parents of future students by creating welcome packs, including a digital tour of the school’s people resources, so that new students can get familiarized before they step foot through the door. The key to advocating is to create a call for action. Students may not be solving a problem directly, but they are seeking to rally support by others to take action, such as fund raising or holding planning meetings. In Nashville, TN, DuPont-Hadley Middle School of MNPS, 5th graders held a dinner for the community to raise money to support the fight cancer. The dinner honored the work of a children’s cancer ward in a local hospital (video). Students talked about cancer and the economic impact. Tying significant content to the issue for the audience was AMAZing. A teacher in Ann Arbor is planning an experience where students will research an issue at school or in the community, including interviewing students or residence. They will write letters about the concern to the building principal (school issue) or the local representative (community issue) to convince them to address the need. Sometimes, educating an audience is the ideal approach. Students research a topic, delve into the complexities of the issue, and share the results to support their opinion or suggestions. I’ve visited many schools where healthy eating options is a concern. Projects Based Learning units are designed so that students can create persuasive presentations on the value of reading serving data before purchasing food or show how little exercise occurs if one sits most of the day in school and then at home in front of a computer or other screen time. The key is that students are not just summarizing their findings, but also expressing an opinion or stand. Sometimes teachers or students may struggle with finding content connections to a community issue or need. This happens occasionally, and may be the time that a scenario is considered. Resist that instinct. Instead, publish the students’ work. Make it available to the public. Post on a blog or wiki that invites comment. Or turn off the comment option for those artifacts that are intended for showcasing only. Prior to publishing, check your district’s policy on what information like student name can be included with the publication. Following such guidelines is critical to the safety of students and the value of promoting their voice. Publication for students means that the audience is not just the teacher and their classmates. The result tends to be higher quality effort and work. 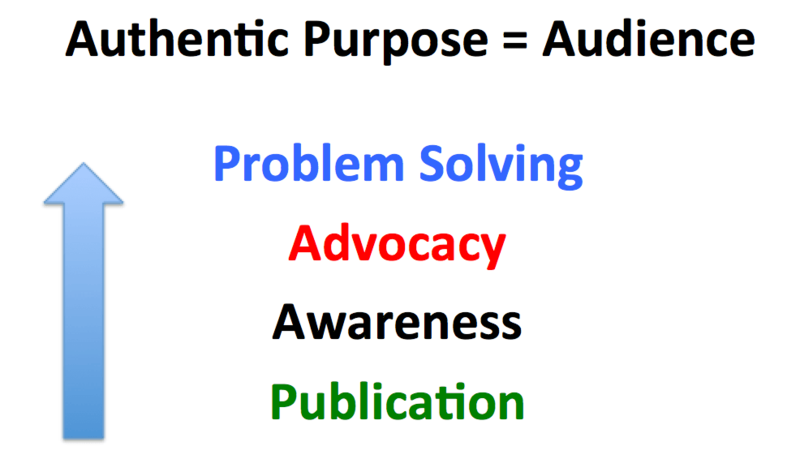 It’s important to note that each of these options for authentic purpose and audience support each other. The first three options should all be published. There is a level of raising awareness when advocating or solving a problem. In the process of solving a problem, we form a plan the advocates for certain people or groups to take action. To be clear, any of the first three options are valuable standalones for students to experience because they provide a face for the audience. When students can “see” their audience (people or organization) it tends to raise engagement and the need for completion. Steven Levy writes about this in The Power of Audience. Students appreciate purpose and audiences that are not scenarios, but are real. At least that’s what my kids, and others I’ve interviewed, say they value. Check out PBL Resources and published articles on instruction. Also, here’s a Differentiated perspective on this topic I wrote for Edutopia: 4 Paths to Engaging Authentic Purpose and Audience. What are other target Authentic Purpose would you add to this list?